The Gir is one of the principal Zebu or Bos indicus breeds in India and is used for both dairy and beef production. It has been used locally in the improvement of other breeds including the Red Sindhi and the Sahiwal. Girs were used to put the red colour and higher Zebu content into American Red Brahmans. The Gir are very social cattle and spend a lot of time licking, touching and leaning on each other. The bulls tend to protect the herd and the whole herd protects the calves. The cows seem to rotate being nurse maids and a large number of the calves stay together with them, but as soon as there is a disturbance the whole herd will gallop back to protect them. The Gir is a medium to medium-large animal, depending on whether they were developed in the Gir valley region or in the surrounding mountain area. The females average 849 pounds with a height of 52 inches and the males average 1202 pounds and a height of 54 inches. The average milk production for the Gir is 1590 kg per lactation, with a record production of 3182 kg at 4.5% fat. * Head: The most unique feature of Girs is their convex forehead, which acts as a cooling radiator to the brain and pituitary gland (source of growth and reproduction hormones). * Ears: Their ears are long and pendulous, opening to the front and resembling a curled up leaf. Gir ears are very large and are an excellent fly and insect swatter. * Horns: Horns are set well back on their heads and thick at the base. They grow downwards and backwards with an upward curve. * Color: The vary in color from pure red to speckles, yellowish red to white with large red spots. Their undercoat is red. * Skin: Their skin is darkly pigmented with short glossy hair, very loose and pliable. They can twitch it anywhere on their body to dislodge insects and have a whip like tail, which is deadly on insects. They sweat just like a horse. * Eyes: A Gir’s eyes are hooded and black pigmented. They can close their eyelids so it is impossible for insects to annoy them. They have a lot of loose skin around the eye area. * Feet: Gir’s feet are black and very hard. * Sheath: The sheath is supported by a very strong panniculus muscle either side. The muscle can raise and lower the sheath at will. Sheaths are very neat and tidy. * Sebum: Is a substance secreted in the skin, which is greasy and acts as an insect repellent. * Physiology: The Gir’s small intestine is longer than that found in Bos Taurus cattle. Digestion is slower and more thorough. Girs tend to rest more than Bos Taurus cattle to carry out the digestion process. This is the reason why they do not bloat on clover pastures. They also require 33% less protein than Bos Taurus cattle to achieve the same result. * Fertility: Girs are highly fertile and calve very regularly. Their calves are born small so calving problems are unheard of. * Milking Ability: The Brasilians have developed a milking strain of Girs, which they use in their tropical dairy programmes. They also cross Gir bulls with Friesians to produce a Brasilian breed called Girolander. Most dairies in Brasil, milk Girolanders. Girs are the milk machines of the beef cattle world. * Beef Quality: Gir beef is wonderfully marbled with a very high meat to bone ratio. Their natural muscling is very impressive. Their loin area is large, flat, and wide, running all the way back to a sloping rump with a highly developed, rounded twist of buttock. They have a wide flat back which runs straight onto a large well placed hump set directly on top of their forequarters. * Hump: The hump on a Gir is considered to be the largest of the Zebu breeds and is very well marbled. It is used as a pot roast. 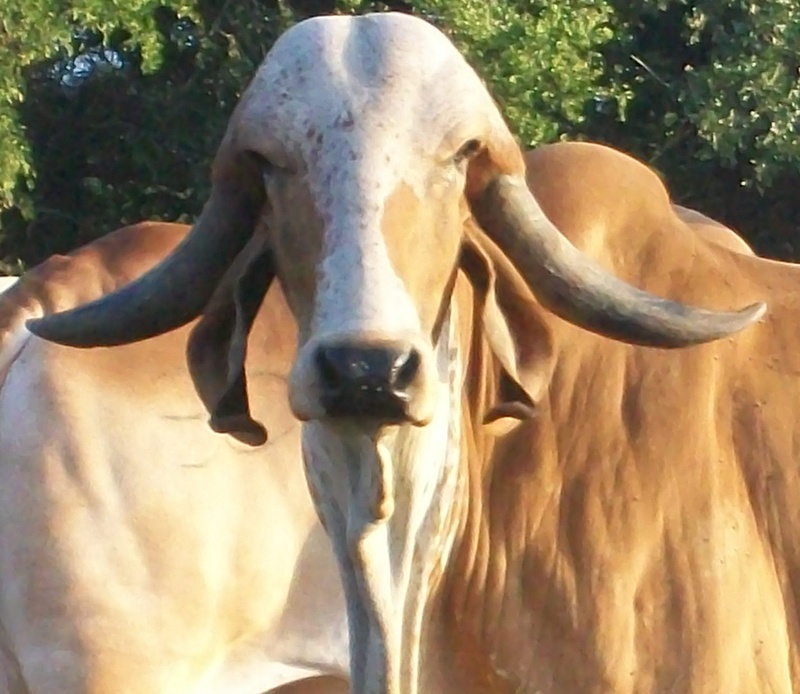 * Temperament: Girs ar considered to be the most gentle of the Zebu breeds. They love being with humans. They adore being brushed and scratched on their big dew laps, around the head, and between the back legs. Their temperament is well illustrated in Brasil where the cow will come into bails to be milked by machines just like any Friesian or Jersey cow. They are very gregarious and at night form a circle very close together with their calves sleeping under their necks. 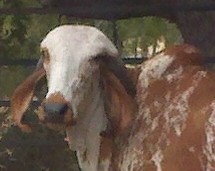 Gir cattle are one of the three Zebu breeds used to develop the American Brahman. Two of the most famous foundation sires, Manso and Emperor, carried a high Gir content. This can be seen in their down swept horns, big humps, straight wide backs, and beautifully sloping, filled out hind quarters.